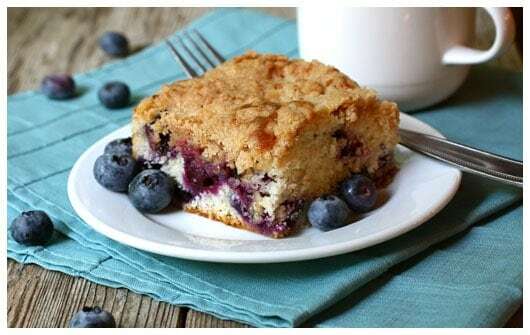 Mom’s Blueberry Tea Cake is an easy-to-make cake that’s beautifully moist, studded with blueberries, and topped with crunchy yumminess. 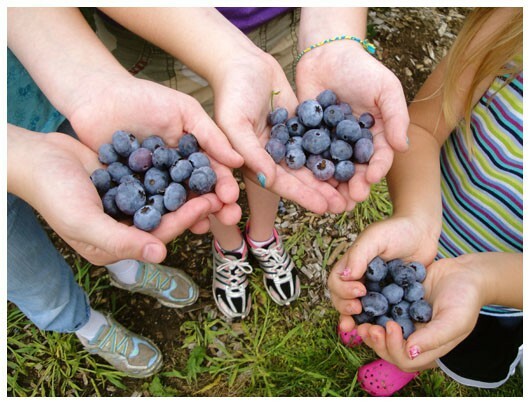 I was so excited to take in my first blueberry picking last week with our two girls and one of their friends. 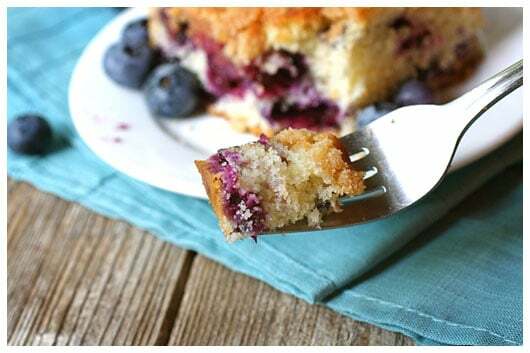 Be sure to read on after this recipe for Mom’s Blueberry Tea Cake for the whole story! 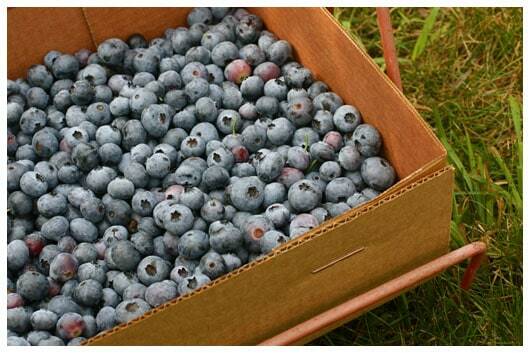 So…what did we do with all those fresh and fabulous blueberries, straight from the bush? Besides enjoying their simple beauty straight from the picking box, we had fun mixing up some old favorite recipes, along with some new ones. 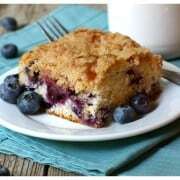 My young blueberry picking companions put together this tried and true recipe from my mom – blueberry tea cake – a moist cake studded with blueberries and topped with crunchy yumminess. The flavor and textures are similar to my Grandma’s recipe for my favorite blueberry muffins in the world, a very popular recipe here on a farmgirl’s dabbles. From the moment I read Aimee’s post on Simple Bites, about how to make your own blueberry syrup, I knew I wanted to try it. And it was pure yum! We topped our family’s favorite buttermilk pancakes with it and wholeheartedly licked our plates clean. I also made a most incredible blueberry cream cheese ice cream and a blueberry mint jam. All three of these new-to-me recipes were complete successes. So much delicious fun! An easy-to-make cake that’s beautifully moist, studded with blueberries, and topped with crunchy yumminess. Preheat oven to 375° F. Grease and flour a 9″ square pan and set aside. Prepare the cake by first sifting together the flour, baking powder, and salt – set this aside. In a separate bowl, cream together the butter and sugar until light and fluffy. Add the the egg and milk and beat until smooth. Add the sifted dry ingredients and mix until just combined. Gently fold in the blueberries. Spread into the prepared pan. For the crumb topping, mix together the sugar, flour, cinnamon, and salt. Then cut in the butter with a pastry blender or fork, until coarse crumbs form. Sprinkle the batter with the topping and bake for 35 to 4o minutes, until nicely golden brown. 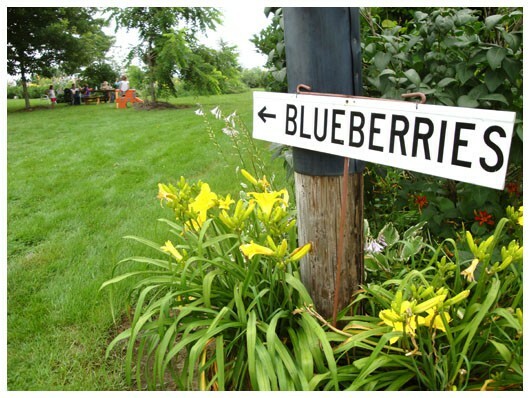 I was finally able to follow the signs to the blueberry bushes! This delicious task has been on my Summer Bucket List for more years than I care to admit. 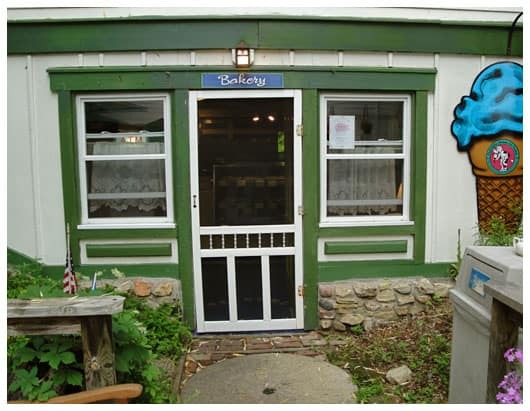 But the trip to Rush River Produce, near Maiden Rock, Wisconsin, was well worth the wait. Heck, the hour-long drive there is a treat all in itself. 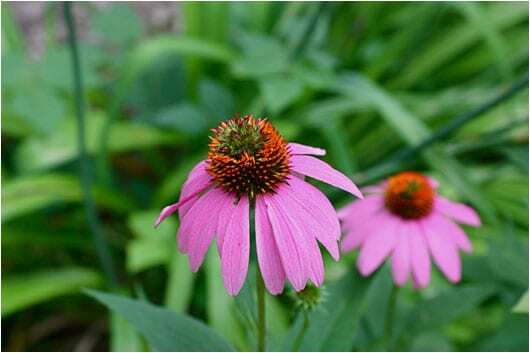 With a mug of vanilla flavored creamer, topped off with just a bit of coffee, and three chattering girls in the seat behind me, we took off bright and early last Thursday, making our way south along Wisconsin’s Great River Road. Winding along this National Scenic Byway, with the mighty Mississipi River below and stunning limestone bluffs above, we were often pointing out the windows in awe. We were plopped into instant vacation mode. 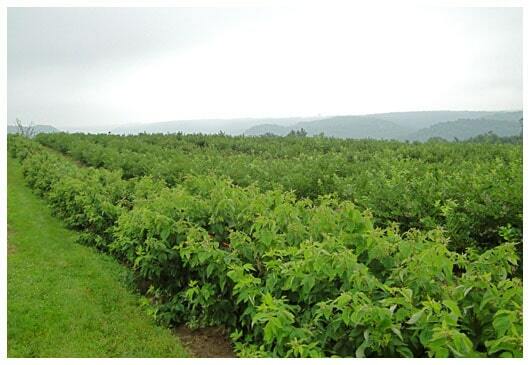 The beautiful farm at Rush River Produce was more than I had imagined. 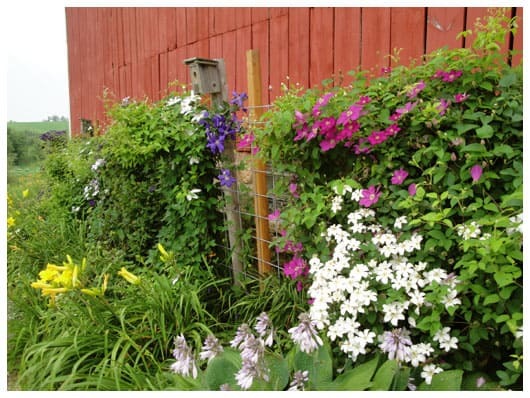 With a quaint farmhouse, a number of outbuildings, and TONS of flowers, it embraced every bit of this here farmgirl. 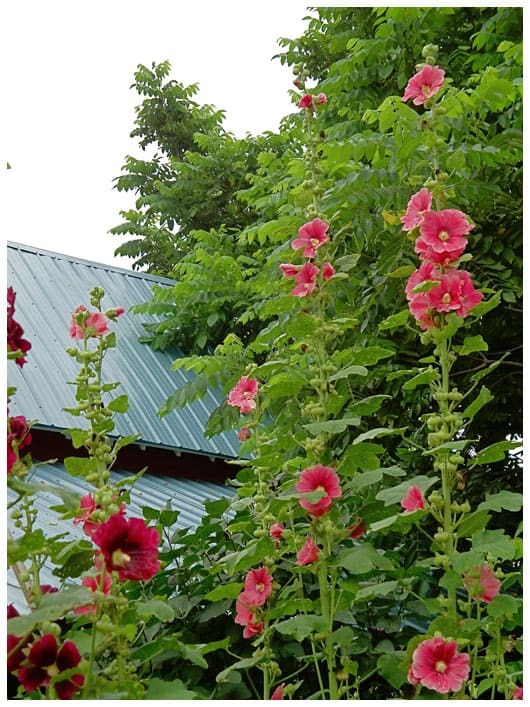 I have never, ever seen so many hollyhocks in one location. Their old fashioned loveliness welcomed us in a special way that I’m sure they never even realized. 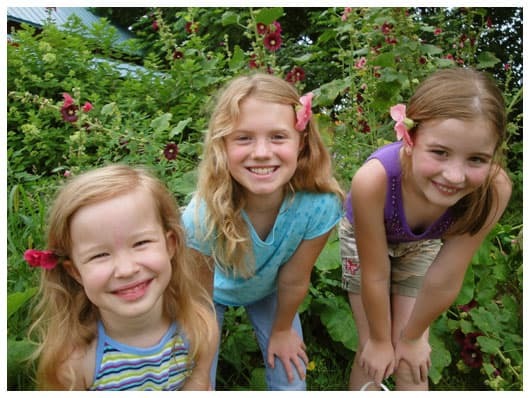 My happiness-oozing companions for the day, aka “The Hollyhock Girls”, took to those colorful extra-tall flowers immediately! Our first sight of the blueberry bushes, with row after row dipping over the misty horizon, promised to fill our boxes with blue hued wonder. Can you just imagine this being your backyard?! The blueberries were just so beautiful. There was no hesitation in popping the first few into our mouths. It was due reward for years of waiting! The girls talked and laughed the whole while, proudly showing me how much they had picked since they last displayed their buckets, surely not more than just 3 minutes prior. I could have picked for hours. But I restrained myself, knowing how I always over-pick with strawberries, and we left with just 1 box. 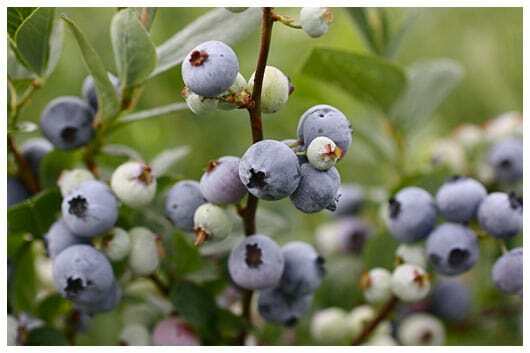 Next year, though, I promise to not hold back as much, as I found the blueberries keep very, very well. Then, like any good group of women out for the day, we got back in the car to find some lunch and shopping. We drove a few miles south to the village of Stockholm (pop. 97! 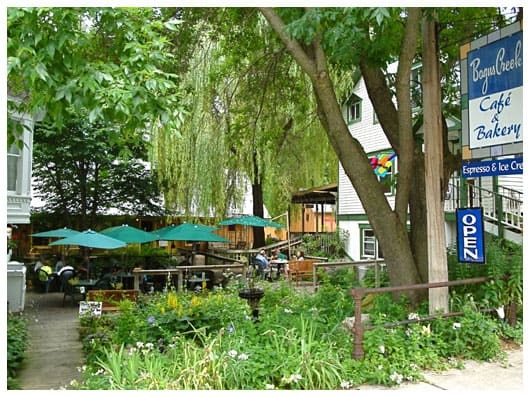 ), to enjoy a lovely meal at a quaint umbrella’d table at Bogus Creek Cafe & Bakery. 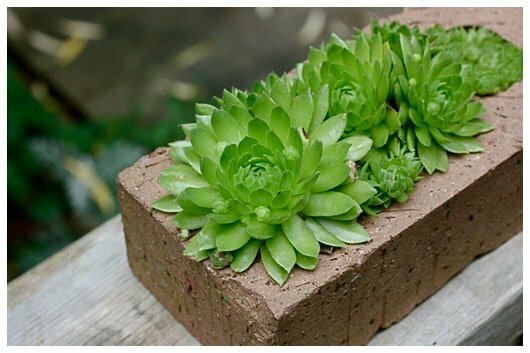 and lush succulents growing playfully from ordinary bricks, we mozied on to the next most reasonable destination. 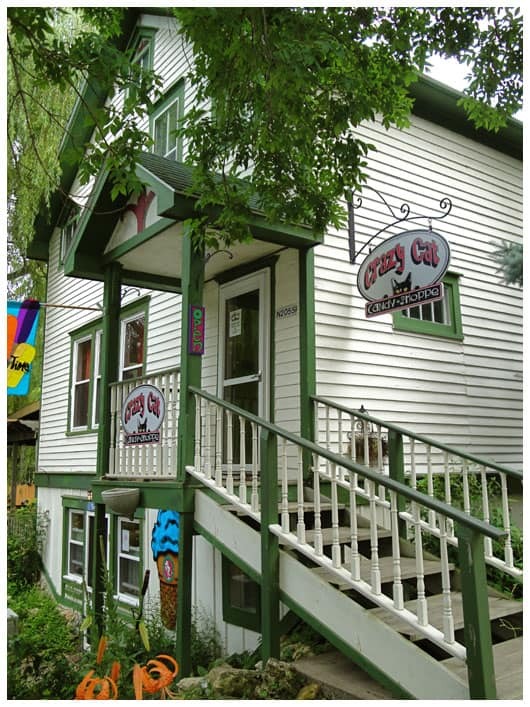 The Crazy Cat Candy Shoppe, of course, for some jelly beans and ultra creamy homemade fudge. With a bakery housed down below, showing off its flaky croissants and gorgeous loaves, this beautiful old home is quite the stop for your waistline. And after we walked all that off by checking out the village’s antiques, Swedish goods, and The Palate – an unbelievable kitchen store feat for a town of only 97 people – we stopped for just one more bite at The Stockholm Pie Company. Yes, when you’re traveling with me, you must be prepared to sample each and every noteworthy edible experience. 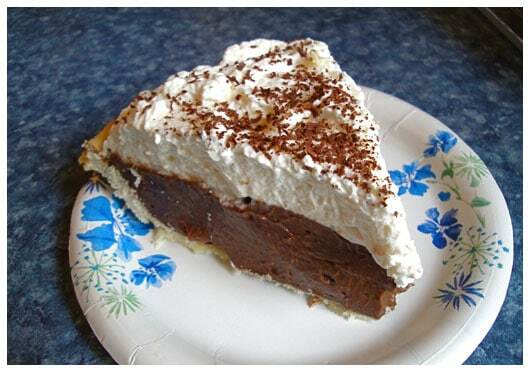 You must know that this was the best chocolate cream pie I’ve ever had. The crust was light, flaky, and perfectly salty. And that bottom layer of chocolate pudding was thick, creamy, and richly chocolate. No Jell-O pudding boxes used here, folks. This was the real stuff! 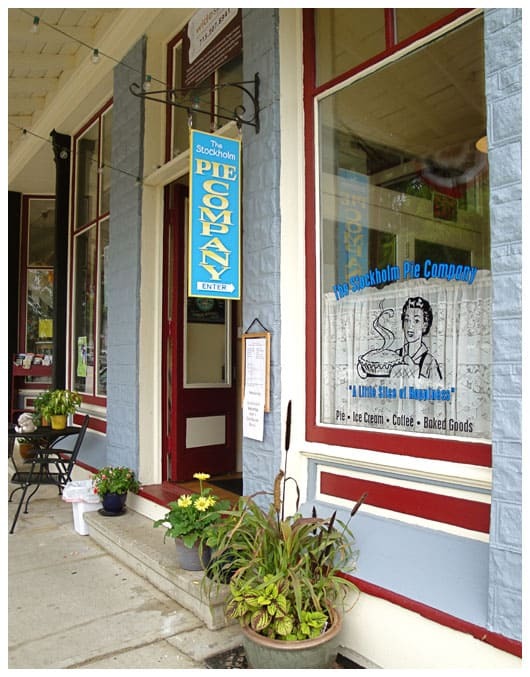 And I couldn’t help but think…if Mom had ever really opened up that pie shop down on the corner (a regular semi-serious suggestion of Dad’s as we were growing up, as Mom is a top-notch pie maker) – to have a little shop akin to The Stockholm Pie Company’s, with its welcoming storefront and exquisite pies – it, too, would have been a huge small-town success story.